Seoul, South Korea -- From India to Korea and Japan, Buddhist statues are one of the most common forms of ancient art in Asia. Sculpted of stone, wood or made in gilt bronze, sculptures of Buddha preaching, meditating or in deep thought have been important objects of worship for Buddhists for two millennia. A rare exhibition in Seoul traces the origins of Buddhist statues and follows transitions in Buddha images with the spread of Buddhism across Asia for 700 years. The exhibit, currently at the National Museum of Korea, brings together what the executive director of the Tokyo National Museum Zeniya Masami calls in its opening “an unprecedented number of Buddhist statues shown in a museum” -- 210 pieces on loan from 26 institutions in China, Japan, India, Vietnam, the U.K., the U.S. and Germany. 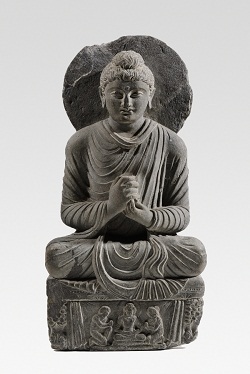 Highlights of the exhibition are two of the very earliest Buddha sculptures made in ancient India. Buddhism originated in northern India in the B.C. fifth century. In early Buddhism, it was considered taboo to make human images of Buddha. 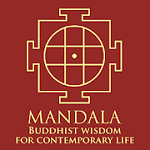 For around 500 years until the A.D. first century, human forms of the Buddha weren’t present. Instead, the cremated remains, or “sariras,” of Siddhartha Gautama, an Indian prince who became the Buddha, served as objects of worship. In the first century, statues depicting human images of the Buddha emerged in two remote places -- the ancient cities of Gandhara and Mathura in India, far from the Ganges River, along which the Buddha preached his faith. Two individual Buddha statues from Gandhara and Mathura dated from the second or third century stand next to each other in the exhibition as highlight pieces. They feature distinct contrasts, each reflecting the unique local cultures and climate. The gray stone statue made in Gandhara features realistic depictions of the preaching Buddha with western facial characteristics and wavy hair -- combined features of the Hellenistic world and Indian Buddhism. The Buddha sits peacefully with both hands clasped in the front and both shoulders covered in robes. What seems more like an Indian native is the second century smiling Buddha statue from Mathura next to it. The Buddha sculpted in light brown rock is depicted with one arm held up as if he is greeting someone, revealing the bare right side of his shoulder. “What distinguishes the two different statues is that the one from Gandhara wears thick clothes while the other from Mathura wears light clothes, usually revealing the right chest. They clearly show different climate and cultures in two regions,” said Yang Hee-jeong, curator of the exhibition. The two places are more than 1,000 kilometers apart. 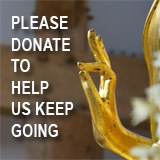 The exhibition further tracks the transition of Buddha statues with the spread of Buddhism across Asia. Buddhism arrived at northwestern China around A.D. 25 via the ancient Silk Road and further spread to northern Vietnam and southern China through the ancient sea route. Buddha statues looked alien to many early Chinese believers as they did in early Buddhism in India. They were understood as one of the Taoist immortals, familiar figures in Chinese culture, or a symbol of guarding the deceased in the afterlife. It took about 200 years before Buddhist images were accepted as objects of worship in China. For the next 300 years, Buddhist statues made in China had both Indian and Chinese features. The fifth century Chinese Maitreya Buddha, depicting the Buddha of the future, from the collection of Metropolitan Museum of Art in New York, is an important piece, showing the transformation from Indian style to Chinese style expressed in depictions of creases in clothes. Buddhism arrived in Korea around the fourth century during the Three Kingdoms Period. Monarchs of Goryeo, Baekje and Silla accepted Buddhism as their state religion, utilizing it to unify clans and legitimizing and strengthening their powers. Korean Buddhism developed a unique style in the makings of Buddhist sculpture. Most Buddhist statues previously being independent objects, in Korea sculptures directly carved into natural rock started to appear. Another highlight is a pensive bodhisattva, a statue of a seated figure with one leg raised up on the other knee and one elbow leaned on the raised leg. This was the iconic Buddhist statue of Korea, which later stimulated Japan in producing a similar kind. Korean Buddhist sculptures made in Baekje also inspired Japanese emperor Kinmei to open discussions on adopting Buddhism as a state religion. Artisans of Baekje went to Japan to help establish the Asuka-dera temple and Buddhist statues. “The statues made in different parts are evidence of cultural exchanges among countries that shared Buddhism as a religion,” said Yang. The exhibition runs through Nov. 15. Ticket prices range from 3,000 won ($2.60) for children and the elderly to 6,000 won for adults. For more information, visit www.museum.go.kr.